Cold drinks dipensers, cold tea or juice dispenser. This range of equipment is dedicated to the HoReCa sector for cafes, terraces, bars, street food concepts, hotels, restaurants and many more. You can choose new or second-hand equipment, according to your current budget. Juice dispensers There is 1 product. 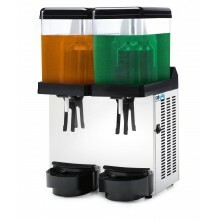 In this section we offer brand new juice dispensers of last generation and tehnology; over the years we have refined our catalogue of machines to make sure we only offer a selection of the best dispensers available on the market. These equipments could be Ex-demo machines or could be the result of a refurbished process of a used equipment. They have been carefully sanitized and reconditioned with worn or damaged parts replaced and are being sold completely clean, revised, tested and set to correct parameters of working. We strongly recommend these machines to end-users or to customers who don't have a proper technical support or to those with a limited investment budget. All these machines are are coming with 3 months warranty and a free training is given on delivery. The warranty commences from the date of invoice for a term of three months. In the unlikely event of claim please return your machine to us to be repaired. In the event of a third party unauthorized intervention, please be aware you loose your warranty and we will not be liable for any costs incurred under any circumstances. Often, used equipment are complete and workable machines, taken out from previous locations or exchanged through a buy-back system. Most of them are not cleaned and unrevised and will be sold 'as they are'. No warranty is given. For our very low prices we are not offering reparation and setting service included in the standard price, but we can carry on this job at extra cost. By their nature, used equipment can vary in quality and price; however, when cost is paramount, these equipments can offer a good alternative solution. 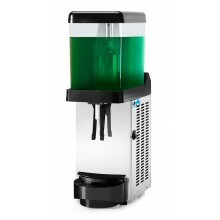 Counter top cold drinks dispenser ideal for HoReCa use, model 'Zippy 2' (2 x 12 litres tank capacity). Price without VAT.